Blackinton B817 6-Point Star Badge with Panel - B817 - 2 3/4" x 3 1/8"
Home > Blackinton > Police Badges > Star Badges > B817 6-Point Star Badge with Panel - B817 - 2 3/4" x 3 1/8"
B817 6-Point Star Badge with Panel - B817 - 2 3/4" x 3 1/8"
Blackinton makes a full line of traditional star badges for our nations law enforcement agencies. 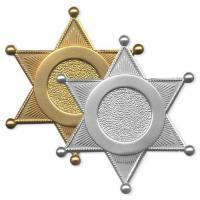 This 6-point badge with panel measures 2 3/4" x 3 1/8" and features fine details and a durable finish that lasts. This B817 and can be customized with print and seal of your choice to fit your departments needs. Wear your badge and take pride knowing it is made in America! Please allow 4-6 weeks for customization and delivery as these are made to order. Dimensions: 2 3/4" x 3 1/8"
7 Point Star with Color Flags - B1329 - 2 3/4" x 2 7/8"
6 Point Star Badge - B1544 - 2 1/2" x 2 1/4"
7 Point Star Badge - B1271 - 1 3/4" x 1 7/8 "
7 Point Star Badge - B1268 - 1 5/8" x 1 5/8"
5 Point Star Badge - AH7695 - 2 7/8" x 3 "
Badge Shield - B592 - 1 3/4" x 2 5/16"
Badge Shield - B607 - 2 3/16" x 2 3/4"
©2002-2019 CopsPlus.com: Blackinton B817 6-Point Star Badge with Panel - B817 - 2 3/4" x 3 1/8"